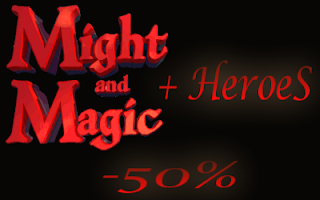 All Might & Magic or Heroes of Might & Magic releases are -50% in GOG this weekend in exception of Heroes V and VI. I'm quite tempted to get digital copies of M&M7: For Blood and Honor, and M&M8: Day of The Destroyer for $2.99 a piece! M&M9 and Crusaders of Might & Magic is also the same price. Other than that the rest are $4.99, such as every Heroes of Might & Magic releases up 'till IV, and M&M 1-6 6-pack. The whole lot of ten games all together seems to cost $41.90 - which in my opinion is pretty darn good price for ten Might & Magic games, although M&M9 and Heroes Chronicles: All Chapters might be a bit of a filler. This promo ends next Sunday night. If you ever still wanted to play Heroes games under modern Windows, might be a great chance. 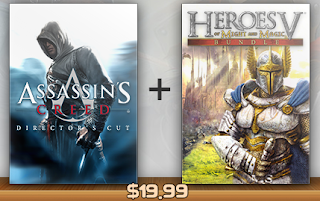 Sadly Heroes V is not that cheap, but you can still get it together with Assassin's Creed - Director's Cut for $19.99 which is not totally bad either (runs 'till Apr 12). Win Amazon gift card or game from GOG - What's your favorite game ever and why? Love to try this game in PCs. Thanks for posting. Yup it's fantastic computer game series, both Heroes and Might & Magic, if you can overcome bit older graphics that is. I think Heroes series graphics have aged bit better. One of the best fantasy game series released imo, and not quite as serious by tone as AD&D games tend to be. Fun games fun times. I got me M&M 1-9 for not playing them a while! Well actually I never played parts 8 and 9 for good. They aren't regarded good as the previous but I'll give them a try gladly. M&M 6-7 are gold, if you're looking for bit more updated graphics, other than that M&M 3, 4, and 5 are also a blast, with bit more dated graphics.